So.. I'm on vacation. :) I've been doing the happy dance since 3:30 Thursday. I would have said 2:50 when the kids left, but I had 2 parent conferences after school and it probably wouldn't have been appropriate doing the happy dance with them present. 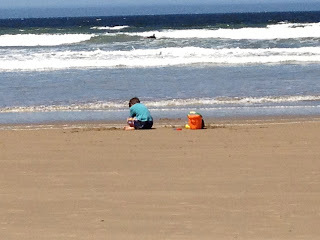 I'm linking up with Doodlebugs Teaching to share some random moments from Thursday. It was a fun day. Well, almost all fun. Then after PE prep we had our own egg hunt in the classroom. They needed to find their own name egg. 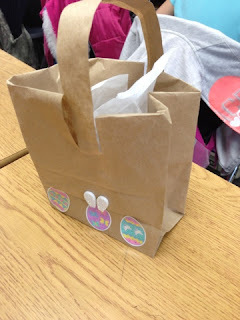 Then we created our paper bag Easter baskets. We made our buddies a basket as well. We went outside and hid eggs for our buddies throughout the playground. When it was time to search we helped our buddies find their specific classroom number. After the egg hunt we had an hour until lunch, so we posed for our Donor's Choose photos and wrote our thank you letters. 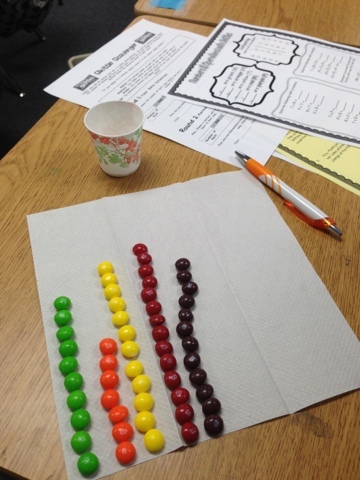 Then we reviewed math skills using the Skittles Math packet. There are tons of activities she provided, I choose 4 pages and the kiddos worked with partners to complete using a small bathroom cup filled with Skittles. After they were done working on them, they separated out their skittles and put them inside their plastic egg to munch on later. 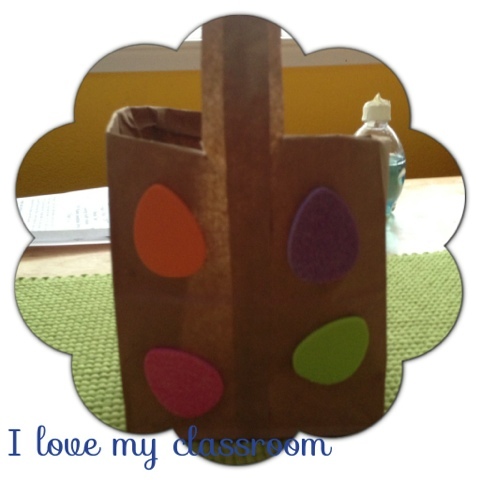 Lunch came and went, I filled their baskets with a bookmark, a homework pass, and a pack of cheese crackers. Why cheese crackers? Because I'm cheesy... ha ha! The kids got my joke. The kids also shared treats to add to the baskets. Then we munched and read and colored. We ended the day outside as a grade level, having Friday PAT on a Thursday. 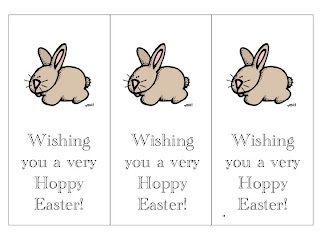 How did you celebrate Easter/Spring? 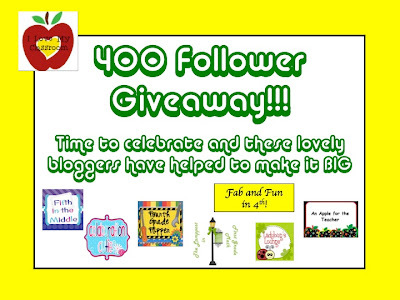 Just a reminder about my 400 follower giveaway going on. Wow! 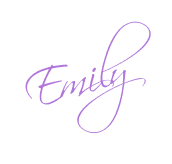 This little blog is growing. We are almost at 400 and I don't want to wait any longer to celebrate. 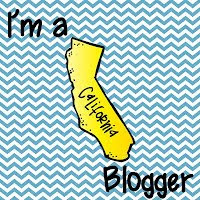 8 blogging friends have helped me to make this bigger than I could have dreamed it could be. 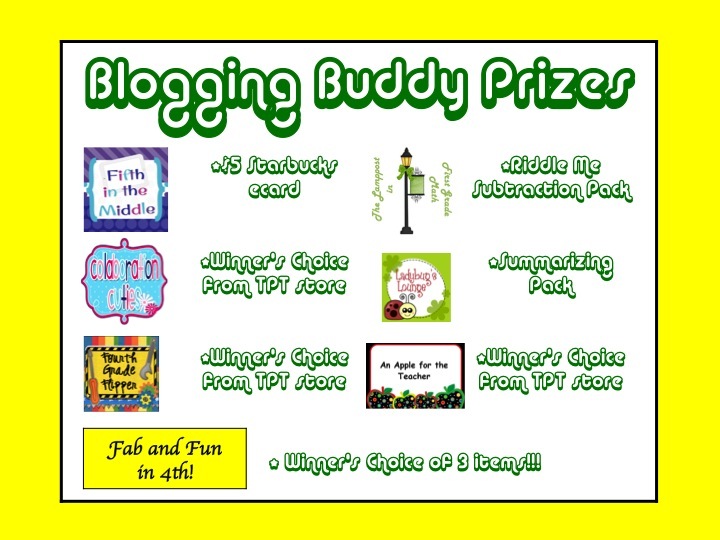 Thank you so much Crystal @ The Lamppost in 1st Grade Math, Kelly @ An Apple for the Teacher, Holly @ Fourth Grade Flipper, Rebecca @ Ladybug's Lounge, Diane @ Fifth in the Middle, Bethany @ Fab and Fun in 4th, and Amanda & Stacia @ Collaboration Cuties. 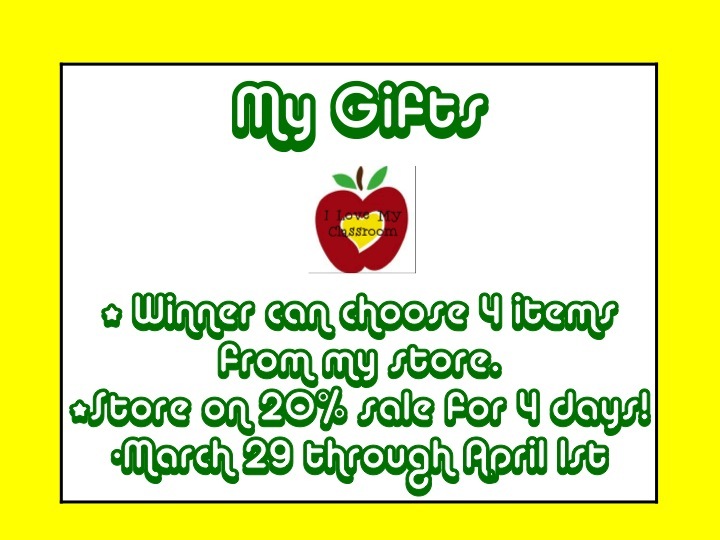 So... when I was thinking 400, I started thinking of things in 4's... like 4 items of winner's choice from my store... and 4 days at 20% off over at TPT and TN. These lovely bloggers have helped me out with gifts... everything from winner's choice items, to specific packs, to a Starbuck's Ecard. Just a little/big something to make this Easter week extra special! 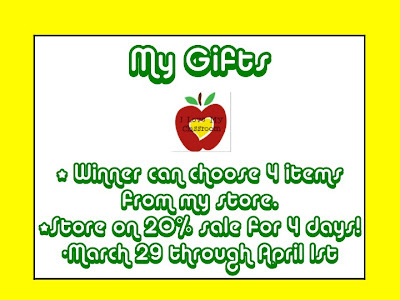 So - don't forget to sign up below in the handy dandy Rafflecopter. The giveaway will go on for the next week - ends on Friday, April 5th. If you are a teacher, you may be wondering about the best end-of-the-year gifts to give to your students, especially as the end of the school year is steadily approaching. 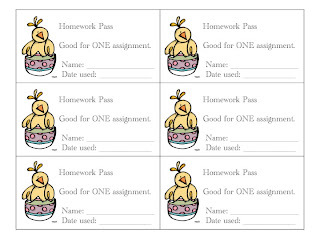 Giving your students a gift at the end of the year is a good idea, especially if they have worked hard and have done well to receive good grades in your class. There are lots of ways to reward the students with different types of gifts, some of which are quite creative. Before you think anything inappropriate, this is actually a cute idea to give to younger students. You can take the Big Hug fruit drinks and tie a small sandwich bag of Hershey Kisses, tie them together with colorful ribbon, and pass them out to the kids. It is an affordable and useful gift for the younger students, especially if they enjoy a little chocolate and something to drink. Just about everyone can get a kick out of this creative gift idea. A special present for him or her could include a homemade DVD loaded with all of the memories for the entire school year. Throughout the school year, you may have taken plenty of pictures with the students for all types of events, such as the Nondenominational School Dance, Thanksgiving Celebration, and even an Earth Day trash cleanup. You may also have gone on several trips with your students where you would have even more pictures, such as a trip to the zoo, local farm, or a museum. You can upload these photos to your computer, put them together in a slideshow with nice music, and then burn them onto blank discs. You can hand the discs out to your students at the end of the year so that they never forget what an enjoyable school year they have had. Not to mention, the discs can be held onto for years. If you need help making the DVD, you can use Movie Maker, which is a program that is likely already available on your computer. Every student needs a ruler at some point in time. This may not seem like an ideal gift, but there are ways to spice it up and make it fantastic. You can attach a finely decorated note to the ruler that says, “Dear Student, You Rule!” After you address the student, you can also write a short poem for all your students, thanking them for behaving and letting them know how much you enjoy being their teacher. 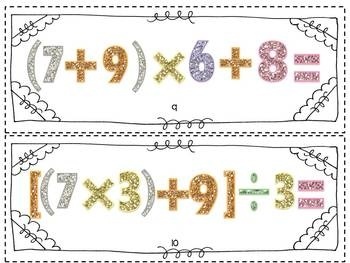 The students will be able to use the ruler when they head back to school during the following school year and they can keep the poem as a keepsake for as long as they want. There are lots of great end of the year gifts for students. It is always best to be creative and fair with what you are giving the students. 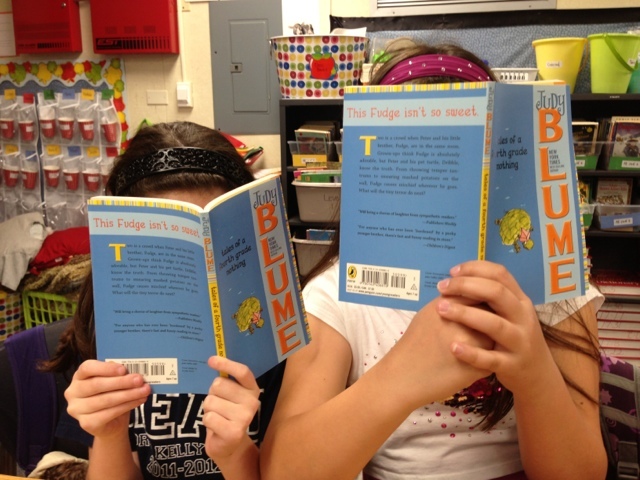 You want to give the students something fun, memorable, and useful. 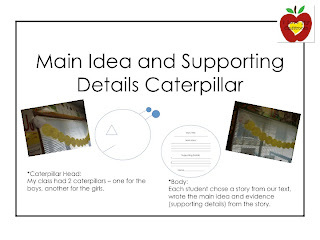 There are just a few of the ideas that you can put together to create amazing gifts for your students to enjoy. With these gifts, your students will feel appreciated and will be very thankful to have been lucky enough to have a teacher like you that cares about them. What gifts do you usually make for your kiddos? Hope you had a great day! Can I mention again that I'm on Spring Break?!? So excited!!! Well, not super excited that my middle son woke up at 4:30 with the same stomach flu as the rest of us... but at least hubby cleaned it up and stayed home today with him. I couldn't miss the egg-stravaganza that I had planned. I'll share more later about my day, but make sure you check back tomorrow because I'm so close to 400 followers that I've decided to celebrate!!! It's party time and 7 lovely bloggers are helping me out!!! I did, though it hasn't been pleasant since I got home. Putting out fires that the progress reports started when they went home. Like I mentioned on FB, I don't know why it's such a shock every single time they go home. All year long the grades have been posted on the online grading portal so families can check progress...and student work/assessments are sent home every Friday... There shouldn't be any surprises in week 30 of the school year! 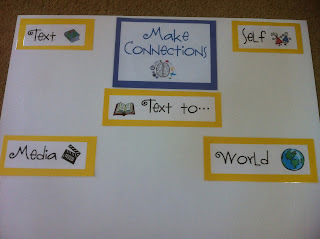 Okay, okay... onto something that is working in my classroom!! 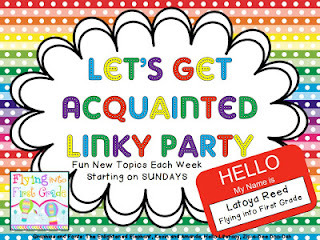 I'm linking up with Holly for the first ever Tried it Tuesday Linky. So what did I try? I used my brand new task cards today and the kids did a great job with them. It's review, so it isn't the first time they have seen the material, but it was important for them to review what operation is completed first. We have officially started our afternoon math stations. By the afternoon the kids are sick of sitting in their desks, and have this urge to talk. So I make them talk about math. I'm sad to say that Social Studies will be put on hiatus for the remainder of this week and the week after spring break... it's all about review before the BIG TEST! Today our math stations included three 20 minute rotations: Station 1 was Order of Operations task cards. The kids also used the Operation task cards from this set. They worked by themselves and then had a partner check their answers. Then when they completed everything, they had a chance to peek at the answer keys. I love answer keys! 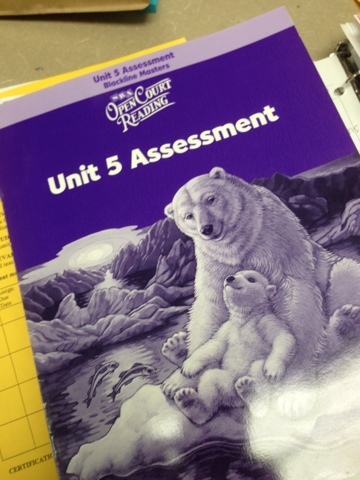 Station 2 was using the Curriculum Associates curriculum to work through a couple of pages of practice test problems. They worked with a partner and had to agree on an answer. If their answers did not match up, they had to walk through the problem together to figure out where one of them went wrong. Tomorrow morning we will go over those same problems whole class to figure out the problems. Station 3 was with me. We reviewed fractions - specifically the skill of labeling a number line. 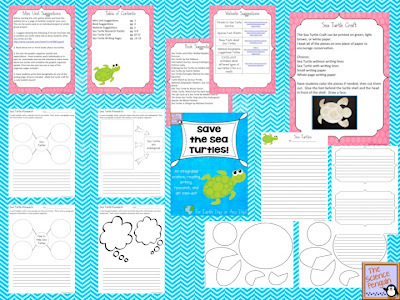 I used this freebie from TPT and we went together through it. The art of counting at it's finest. I sounded like a robot saying over and over again, "Now, what fraction does this 1 whole equal?" That was the skill they messed up with the most on the practice test though, so it was important since it will transfer to the mixed number lines. Okay, I'm done and ready to go read some blogs! Have a good night! Second post of the day - I doubt you will mind though - it's a FREEBIE! With my day at home, I am quickly trying to make sure everything is prepped for the end of this week, and finally go on our spring break!!! 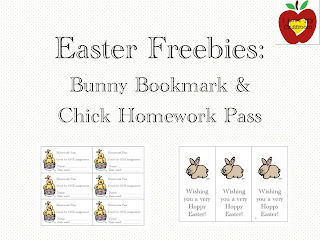 The laminator is humming and I'm prepping these bookmarks for my school kiddos' Easter baskets. Click on the image above to go and download. What? Easter baskets? Yes, my school kiddos make up Easter baskets on the day before vacation. It's a quick little art project, but they love it and I enjoy a place for them to store all their goodies. By goodies I mean their Easter egg that has their name on it (they find their specific one during the Easter egg hunt), the cute bookmark, a Homework Pass, a brand new pencil, and some other odds and ends. How do they make up their Easter basket? With just a plain paper bag. That's it. I then let them put a quarter piece of tissue paper inside to help fill it out a bit. Then they decorate it. This year I splurged on the foam egg stickers - usually they just color or trace a bunny on it. Here are some pictures of how to create it, in case you are interested. 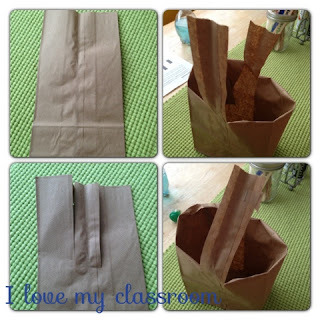 Step 1: Take a plain paper bag and cut an inch strip from the top going vertically down about halfway. Step 3: Staple (or tape) the strip together - creating a handle. I also caught up on all the sales sent to my "spam" email account - like the $5 cute Old Navy toddler shirts... and the 50% off Osh Gosh... but that's not the real point to my posting. I adopted a Sea Turtle this morning. He's a little hatchling and my own boys were like proud papas since I adopted him literally 5 minutes before we ran out the door to take my older boys to school. We named him Sebastian. The Science Penguin mentioned she had adopted a Sea Turtle named Fred in her post this morning. I thought it was a great idea - a class pet that I don't have to remember to feed, bring home on the weekends, or change a cage. 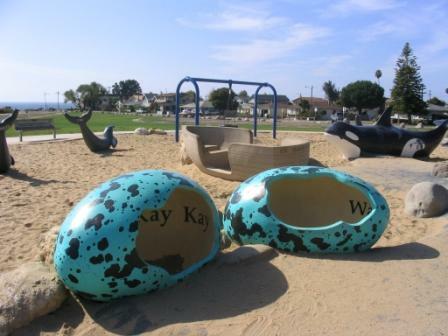 Then she mentioned that she will send her Sea Turtle Unit to anyone that adopts. Her idea (and one that I'm also going to do) is use the pack to help celebrate Earth Day. Here are her pictures of the pack. Doesn't it look fun? Interested in adopting a Sea Turtle too? 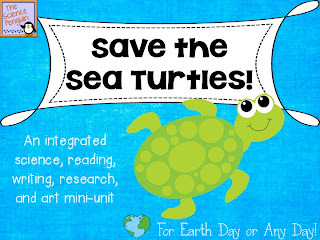 Head on over to Sea Turtle Inc. to sign up! Have a great day! 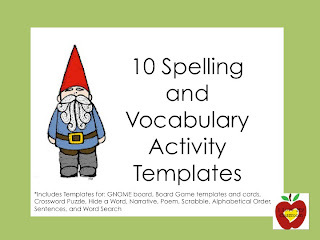 I'm finally linking up with Flying into First Grade to play the noun game. Since it was just my anniversary, I'll choose my husband as my favorite person - though all my boys are my favorite. :) I love my husband for so many reasons. He knows those reasons too since I made up one of those Pinterest inspired frames a while back as well as used a deck of cards to make "52 reasons I love you" for last year's Valentine's gift... of course I keep forgetting to change up the reason on the frame lately - it's been stuck on "Because you take care of me" for quite a while now. Here is a picture of us on our honeymoon 11 years ago - we were standing on the top of a crater in the clouds of Hawaii. 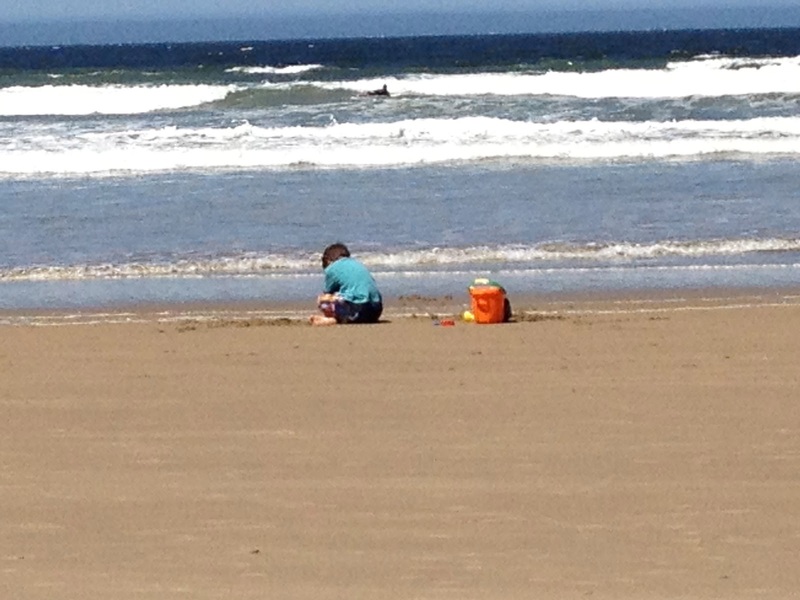 My favorite place in the entire world would have to be Pismo Beach. 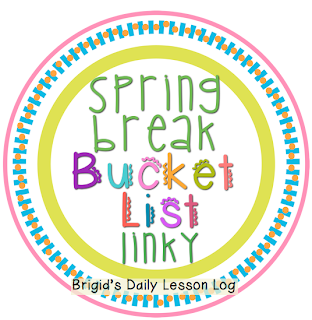 I wrote about it a bit ago with my Spring Break Bucket Linky. Countdown to visit in 1 week!!! If I could do anything in the entire world, I would probably grab my Kindle and settle down for a nice long read. LOVE IT!! I also am thankful for Pixel of Ink and Inspired Reads with their long list of freebies to download. I love my puppy. 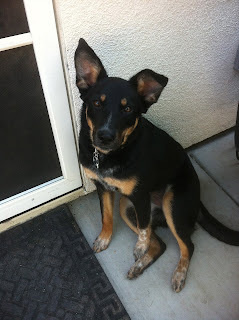 Her name is Minnie and she's part Kelpie, part Shepherd. We picked her up from the pound when she was 5 months old, Minnie was her name and we didn't change it... Why, you ask? My now 3 year old loves Mickey Mouse and well Mickey needs a Minnie... Her anniversary of coming to live with us is on April 13th, we should probably have a party to celebrate... my family likes to celebrate everything! What a year it is has been having her in our family! So - that's me in a nutshell! I'm linking up with Jivey today to tell about Reading Graphic Organizers in my classroom. I've shared these posters way back last summer after I made them for a Monday Made It... They hang over my whiteboard. 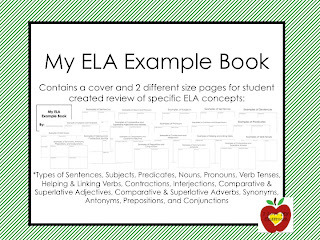 The kids write it out on a piece of binder or copy paper, and then stick them into their binders. Copy budgets are an issue, so it was important they could create it themselves since we use them every week. 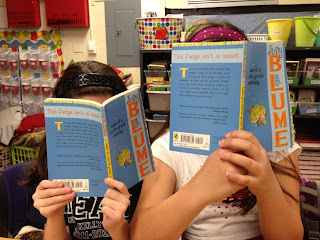 We preview the story on Mondays after we define our weekly vocabulary. 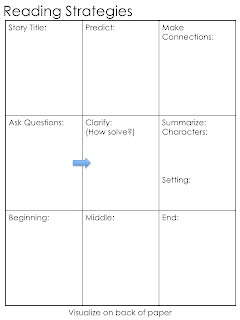 The kiddos just draw a simple 4 square on the back of their vocabulary words in their composition books and make connections as we go through it quickly. 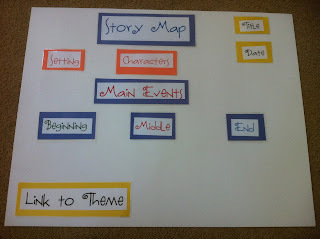 On Tuesdays, they take a piece of copy paper and draw the basic outline of the Story Map. This works well for a fiction story... not too great for a nonfiction one though. This version is free in my TPT store. 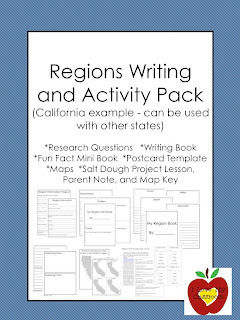 I gave each student one copy of this at the beginning of the school year, they keep it in a plastic sheet protector in their binders for easy reference when creating their own. 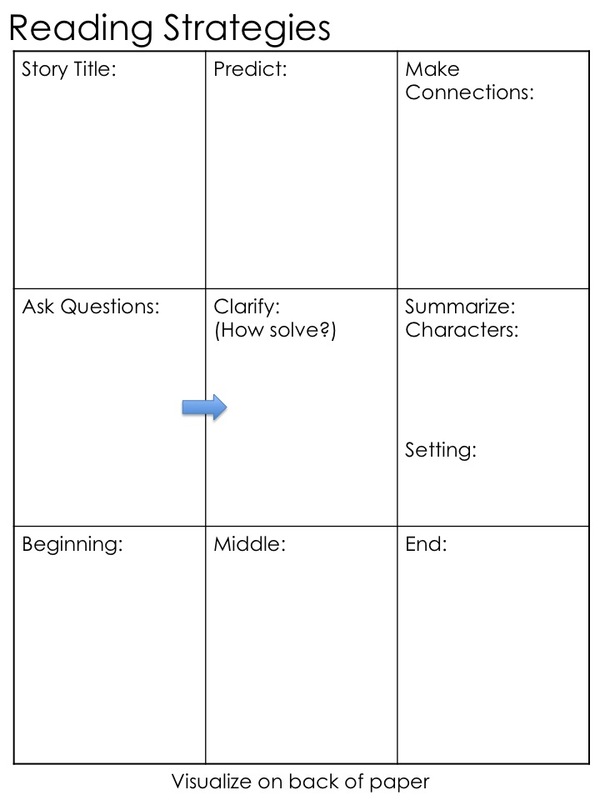 I was thinking about the Story Map lately - wanting to change it up to work on more skills each week - more than just summarizing, so just last week I created this. Maybe it will help someone else though. Enjoy! Hope you had a great day! Newest news with my mom is she is feeling a lot better and her sodium levels have gone up a point. She just needs to gain one more point until she is able to go home. Thanks for praying! I'm a Christian and I believe in miracles. My mom needs one please... so if you are so inclined, could you say a little prayer for her? 9 years ago my mom had her first heart attack, and it was a humdinger of a one... ended up with a quadruple bypass as a parting gift from the cardiologist. Since then she has had 2 pace makers, numerous stints, and other health issues that sometimes relates to her heart, other times relates to her sodium (or lack of sodium) levels. I'm not at the point of completely understanding how one's life can revolve around doctor's appointments, or medications, or sodium levels... other than what I hear from her during our daily talks. Yes, daily... I love my mom and she's basically the only one in my family that allows me to vent about school (since she taught for 37 years herself). Well, last week she wasn't feeling good. My parents had gone on vacation - since that's what retired people do - and she developed a pinched nerve due to having to sit in an uncomfortable wheelchair for hours and hours visiting Hearst Castle... so she wasn't able to get around and move... and the muscle relaxers afterward made her tired, so she didn't eat... and somehow her already low sodium dropped to an even lower/dangerous level. There is a reason I didn't go into medicine like my sister - I don't like hospitals or blood or dealing with medication or seeing people in pain. Yet, I have now learned that my mom's 122 sodium level is very close to the 120 coma & stroke level... so yes, it's been a little scary. I have also learned that dangerously low sodium causes people to become very confused and forgetful. Like not knowing the day, year, birthdate, president... it was 1944 there for a while. Yesterday morning my parents had an eventful day starting with a fall (due to a dizzy spell), a call to 911, a ride in an ambulance, and then a bunch of tests. Over 36 hours later and her levels remain the same. They need to go up or tomorrow there will be more tests regarding her kidney functions. So, if you have a moment - you could you please say a prayer for her? Happy St. Patrick's Day everyone! I need to remember to wear green today, don't want to be pinched!! 2. I will walk every morning on this beach and on this pier. 3. I will go shopping on this main street... they have a magically delicious frozen yogurt place about 1/2 way down the street. This is about a 3 minute walk from the hotel. 5. ...and will most likely go with my mom and my sister to shop at the outlets. 7. I will also spend a lot of time reading. 8. I should probably do some laundry... or some cleaning... or some organizing... or some grocery shopping when we get back home. 9. If I get inspired, I might create some more things for my class and for TPT. Here are the things I've added to the store since last Sunday. Thanks to All Things Upper Elementary and Mrs. Wheeler for the adorable buttons! 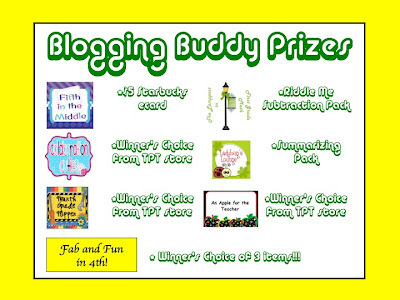 Mrs. Wheeler is having a linky party - so check it out! Everything is still 20% off the rest of today. Game Board Templates = End of Unit Fun!